Doxorubicinol is the primary circulating metabolite of doxorubicin which may be used as an antineoplastic. Gemifloxacin mesylate is an oral broad-spectrum quinolone antibacterial agent, used in the treatment of acute bacterial exacerbation of chronic bronchitis, and mild-to-moderate pneumonia. Prolylvaline is a peptide with antibacterial properties. 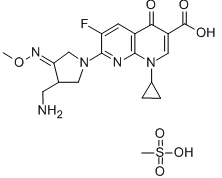 Sulfaphenazole is a long-acting sulfonamide antibiotic used in the treatment of leprosy. Cefetamet is a cephalosporin compound having methyl and [(2Z)-2-(2-amino-1,3-thiazol-4-yl)-2-(methoxyimino)acetyl]amino side-groups; a cephalosporin antibiotic active against Neisseria gonorrhoeae. Ganciclovir Monoacetate is Ganciclovir derivative. Framycetin Sulfate is the sulfate salt form of framycetin, an aminoglycoside antibiotic isolated from Streptomyces lavendulae (decaris), mainly containing neomycin B, with broad-spectrum antibacterial activity.